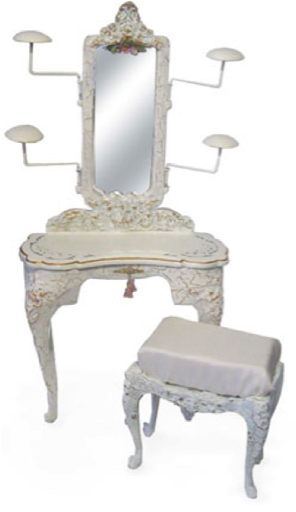 Students will complete a 13 x 6” French Rococo dressing table with wing mirrors made in resin. 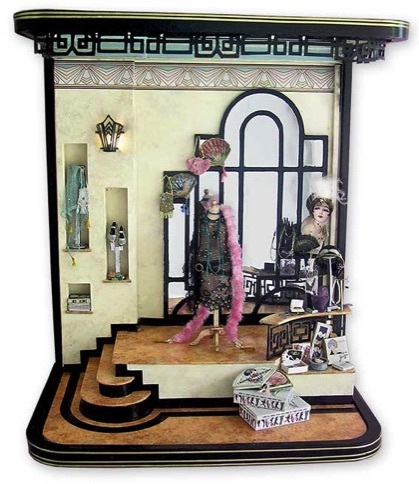 Catherine has scaled the dressing table to complemet a 11-12” Fashion doll. 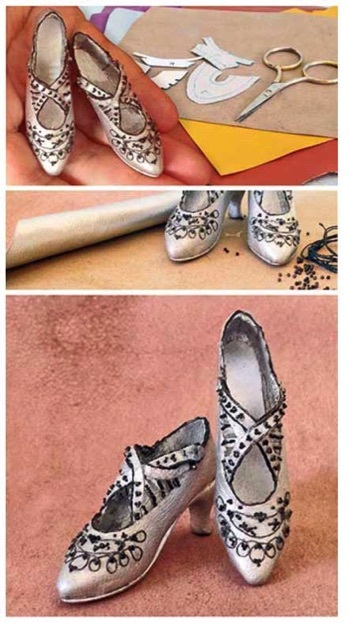 In class you will learn paint antiquing techniques, apply decal and hand craft miniature tassels. 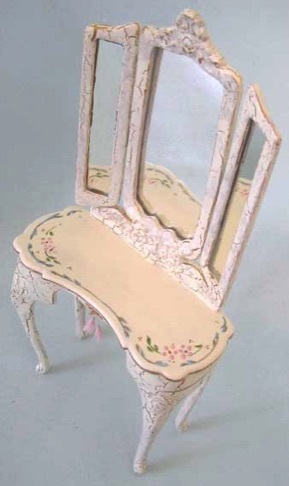 You will complete the table by attaching the wing mirrors with brass hinges. fine sewing needle and sharp scissors. 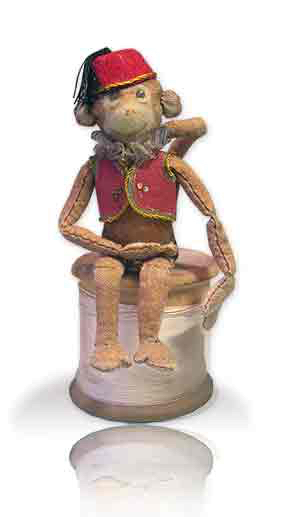 From the nursery toy cupboard comes the Ring Masters top hat, Victorian Harlequin clown and Tumbles the circus monkey. 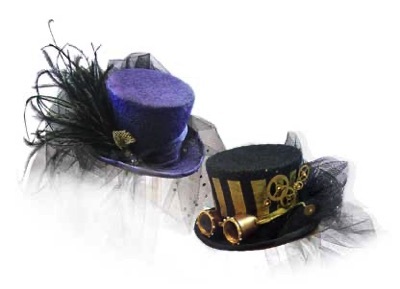 Catherine will share her skills in millenary with each student completing the ring masters pre blocked felt top hat, decorate it with a colourful circus hat band and progress on to assembling filling and dressing the pre stitched Harlequin clown rag doll. 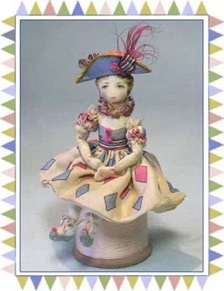 The Harlequin is dressed in a printed silk gown, organza ruffles and to complete her ensemble a bi-con hat. Included in the class Tumbles the monkey his fez and bunting, come as a kit to complete at the students leisure, with skills learnt in class. 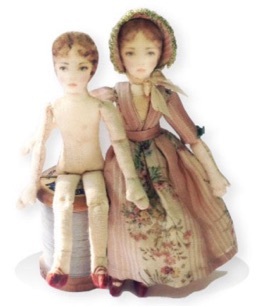 Small box will be provided for the top hat & dolls journey home. Duration: 3 hours Cost $98. From a delicately wired fairy halo to the floral cascade of a brides bouquet, floral embellishments add that spot of interest to any figurative work. In this class learn to cut, shape and assemble a range of different style and size flowers and greenery. Working with silk, velvet and vellum assemble and wire briar roses, pansies, orange blossom flowers and greenery. Shaping and detailing as well as adapting flower patterns to make your own unique blooms. 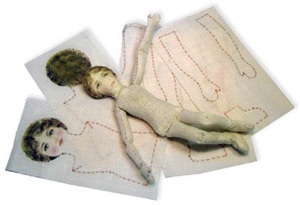 The focus of the class will be to translate a sketch into a flat pattern, then into a three-dimensional paper pattern ready for fitting on to figurative doll With the diversity of doll styles, students are encouraged to bring their own doll to work on, ensuring a perfect fit. I will be teaching both the French style of draping and traditional pattern making, with techniques that manipulate the bodice, sleeve and skirts enabling many variations that cross both historical eras and fantasy designs. Beginner, Intermediate, Advanced. No experience needed. workshop locations listed below, join our Online class. Your kit with all its components will be posted to you, along with a link to our online tutorial & contact email. The tutorial is very detailed with step by step photos and written instructions for every piece of the glitter village, that’s the advantage of on line lots of images. yes we can do that too! The class includes 3 different style houses and one church, pre cut from card stock. and coloured glitters, trims and micro beads. 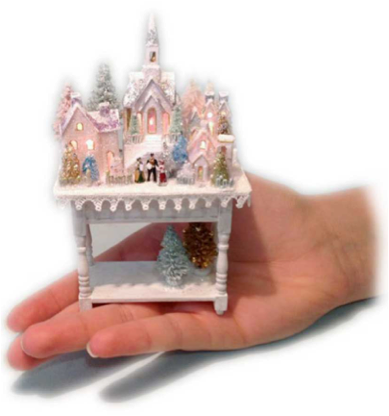 Students will assemble the little pre cut houses and church, add window panes and decorate with assorted glitters. Then dress the trees with glitter, micro beads and mini diamanté. 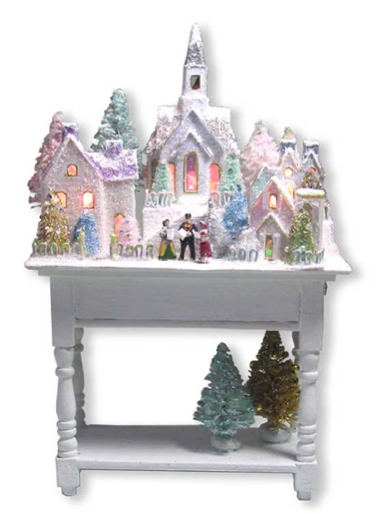 Arranging the beautifully decorated little houses on the table is the final part of the class, then sit back and turn the lights on! 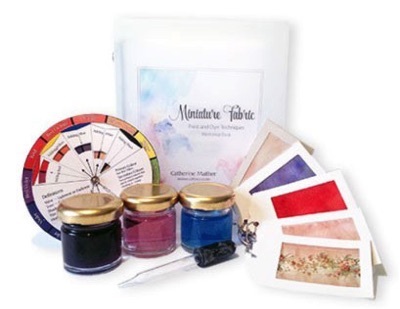 Catherine with share tips and tricks for mixing a range of readerly available dye products, achieving antique colours for dress fabrics and home furnishings. Learn how to inkjet print and hand dye fabric and flocked paper, ribbon and braid suitable for costuming, curtains, furnishing and floor rugs.  Colours and patterns for different eras will be available to coordinate. A5 Binder notebook for adding samples and recipes during class, and 10cm Colour wheel. Students will need to bring small sharp scissors, glue stick ( archival), pencil, ruler and plastic apron. Victorian attire, pantalets, bonnet and gown. 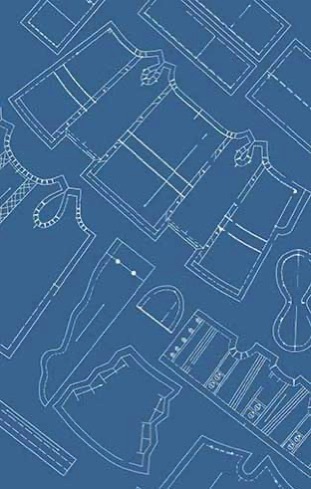 You will need to bring small sharp scissors, needles and pins. 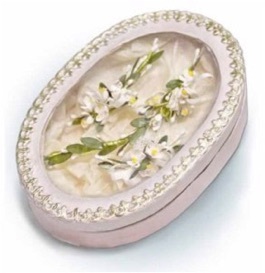 Sewing needles and pins, ivory sewing thread, tacky white glue (aleene’s), clear craft glue stick, small sharp scissors, small ruler, fine ball styles, 2’’ square of old mouse pad for shaping flowers small pair pliers. This elegant bonnet worked over a millenary block proved, will enable students to create a fashionable 1880’s circuit Parisian silk velvet bonnet. The bonnet is pre blocked in wool felt giving a strong form to apply the velvet and lining of ruched silk tulle. Then learn the secrets of hand crafting antique style orange blossom sprays to decorate the bonnet, with additional sprays for an evening gown hem, waist and décolletage. 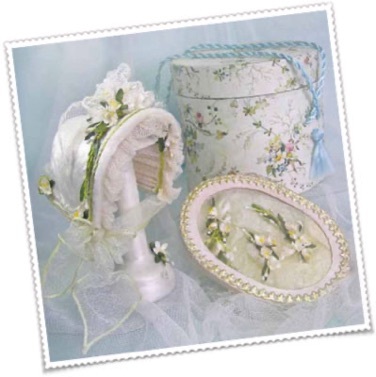 Keep your bonnet and flower garlands safe with a pre assembled hat box and display box, ready to complete with papers and trims. Bonnet size 5½ head circumference. 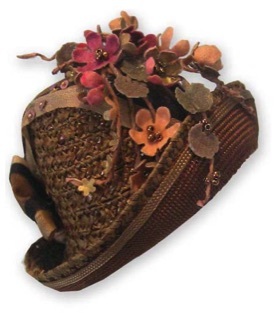 techniques, include shaping and blocking woven textiles, hand stitching millinery braid and creating silk and velvet flowers embellishments. What will students take away? cloche hats sized for a 18’’ figure. 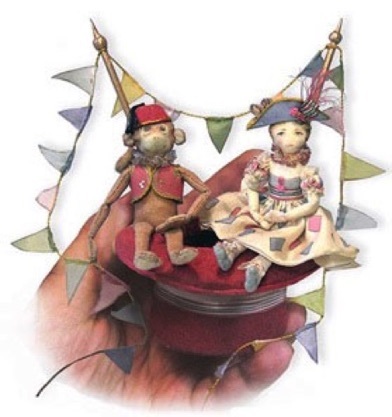 The techniques taught will enabling students to be confident creating a diverse variety of hat shapes and styles in the future. millinery needles and thread,selection of fabrics flowers and trims. Teacher will collect payment during class. 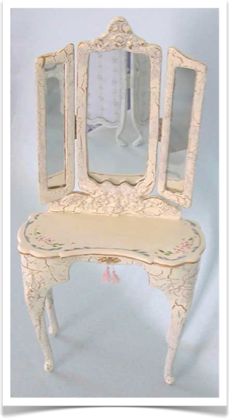 Students must bring Small sharp scissors, fine wire cutters, clear glue, white craft glue, spray atomizer hair dryer. Art Deco era evening shoes. hour glass heels and shoe soles. 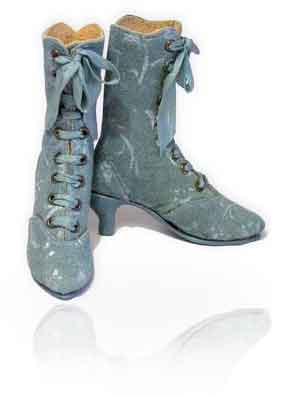 of shoe lasts The techniques taught will enabling students to scale up or down, creating shoes in a wide range of sizes and textiles. Small sharp scissors, 6 inch metal ruler, craft knifeleather glue, fabric glue, soft lead pencil, rubber. Delicately wired paper flowers and greenery cascade from this vintage style bouquet, designed to drape over the arm of a 1920's bride. 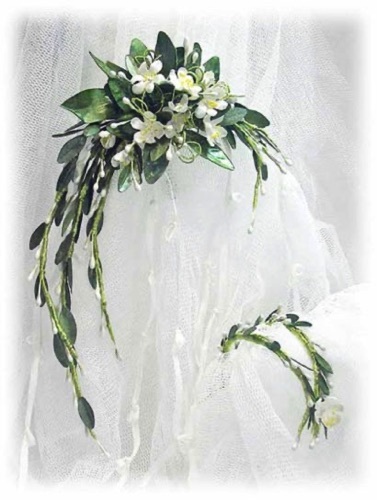 Each student will assembly pre cut flowers and greenery, learn how to wire and shape orange blossom sprays, adding details of pearl and silk ribbon trails to the bouquet. To complete the bridal theme a matching halo of orange blossom, pearl and silk ribbons will be made and displayed in a vintage style display box. 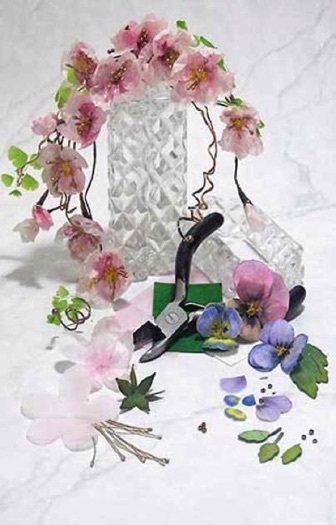 Students will need to bring a long small sharp scissors, clear craft glue, Aleens tacky glue, small ball styles, mouse mat for shaping flowers on and fine wire cutters. 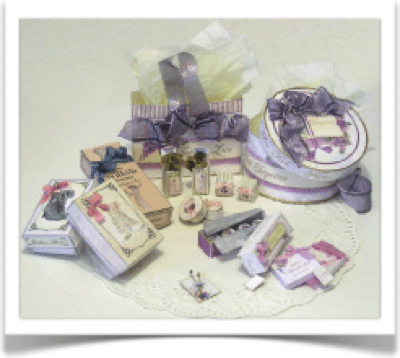 Workshop includes, all materials and a small box to carry your bouquet and head dress home. 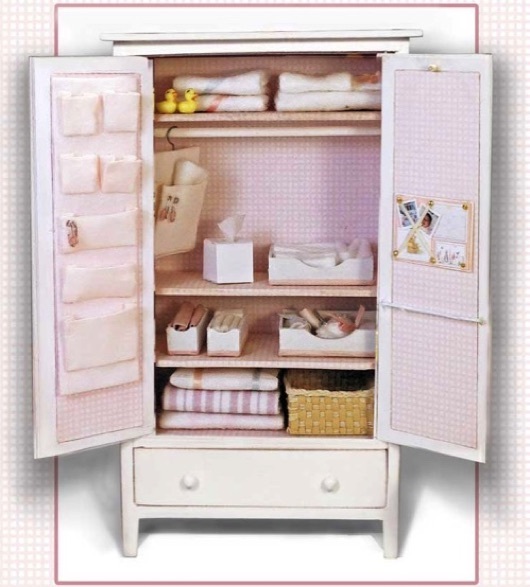 organizer for the door, ready to be filled with baby essentials. 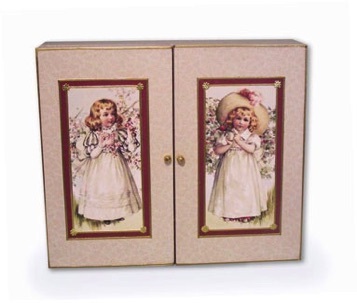 Baby blankets, sheets and wraps prettily decorated and trimmed in class with silk bows and ribbon will then be nestled along side a set of storage boxes also to completed. 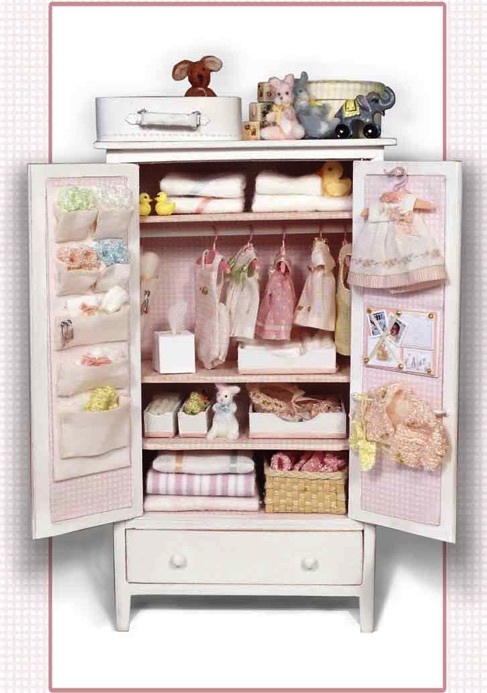 Class includes a number of extra accessories to decorate baby's wardrobe, yellow ducky, grow chart, nappy bag hanger, tissue box cover with tissues. This charming collection of little girls clothing will be made using Catherine's no sew technique which allow students to quickly master the skills needed a to create miniature scale clothing, with only a small amount of hand sewing. Custom designed, printed cotton and silk clothing in a variety of pastel colours will be assembled during class, three sundresses, one romper suit, baby layette jacket, bonnet, bib, mittens and booties along with set of decorative coat hangers. 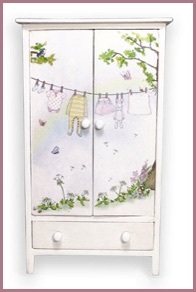 The nursey wardrobe is displayed here with both workshops and addional kits that are available and sold seperatly. 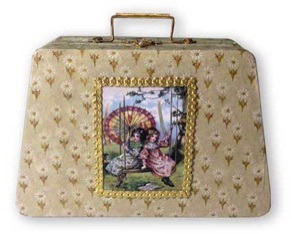 This lovely small suitcase shaped box, inspired from the pages " Au Bon Marche “ catalogue is made of three sections that open on two sides, revealing a cute 2’’ bisque dressed doll, suspended from the central case frame on a swing. 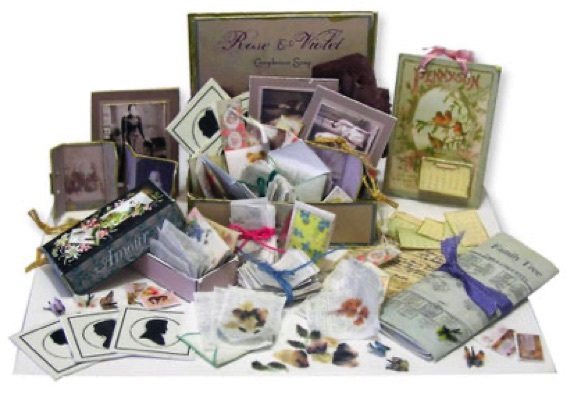 Both sides are filled with small accessories including a winter hat, jacket, muff, mittens, skates, lace handkerchief, purse, fans, hand mirror, skipping rope, silk bonnet and many paper treats. 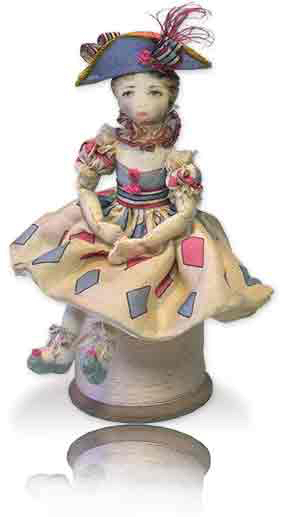 The all bisque doll comes dressed ready to complet with bows and silk bonnet. 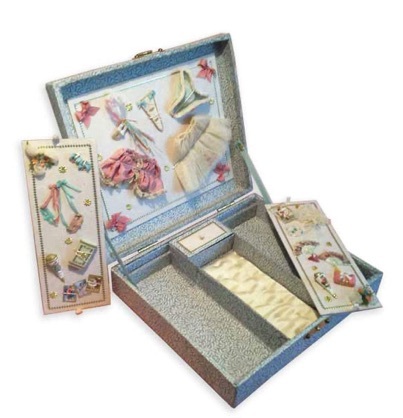 Students will decorat the pre assembled box, interior and completing the accessories, giving time for learning the finer skills of decorating and embellishing. 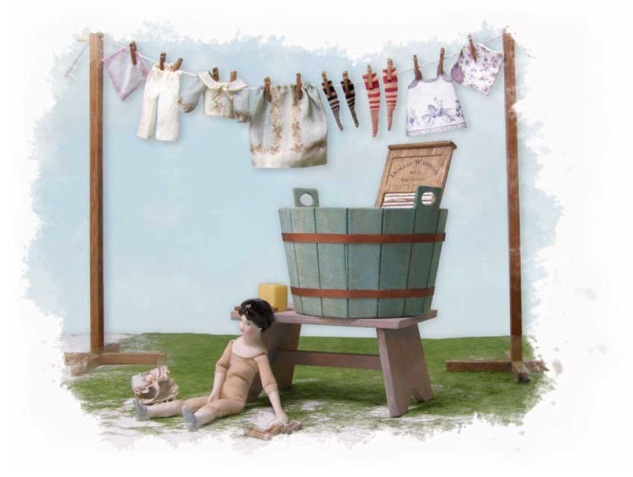 Rekindle childhood memories with this charming workshop - a vignette of a dolly’s wash day. 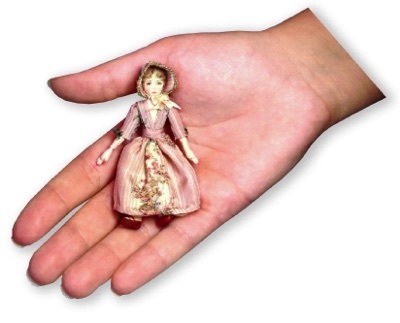 You will create the clothes for the little china head doll, ready to peg on a display clothes’ line. 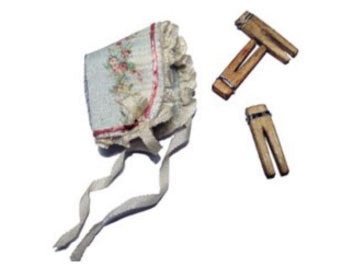 Catherine will share her quick no - sew techniques for making miniature doll clothing, as you make the apron, bloomers, dress, petticoat, bonnet and socks for our dolly’s wash day. 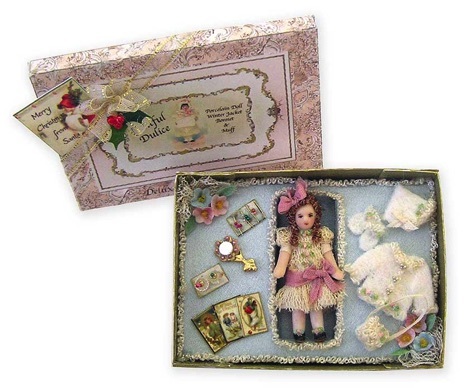 Pre - assembled 4” china head doll, wash tub, stand, soap, twig clothes line, pegs and pre - cut doll’s clothing. 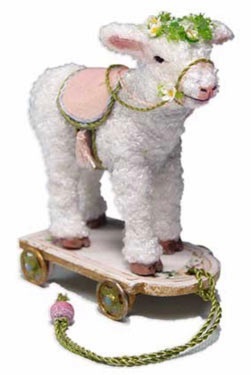 In this class Merle will share her technique for soft woolly fleece, applied to Daisy a 1/12th scale resin lamb. 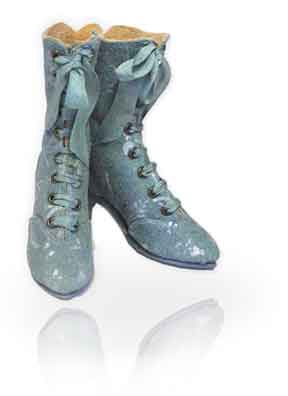 Decorate Daisy with a saddle, halter and wreath of spring flowers before securing her to the vintage style pull a long. 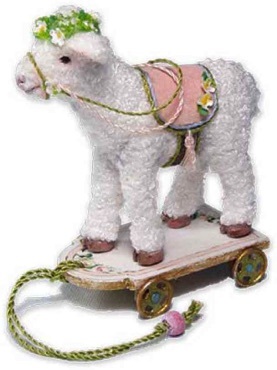 The movable metal wheels and wooden base of the pull along will be finished with a soft pastel colours and a floral decal, Daisy will make a charming toy for a larger doll or a loverly addition to a dolls house. time for learning the finer skills of decorating and embellishing. 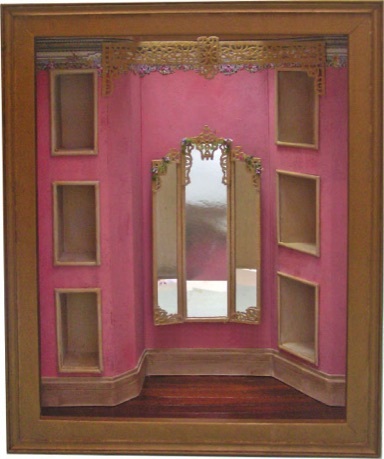 A beautiful display for any 4 1/2” doll. 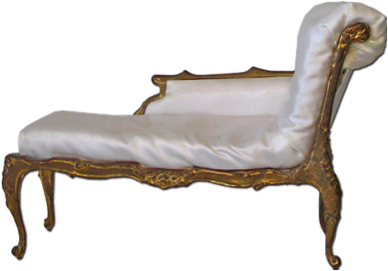 All materials to complete this work shop are provided in class. Tools needed small sharp scissors, clear craft glue and white glue, pins & needles. This class needs no advanced skills and will be complete on the day. 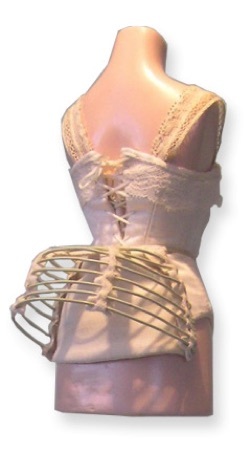 Students will produce a busk fronted corset, the busk being the ridge loop and post closure. 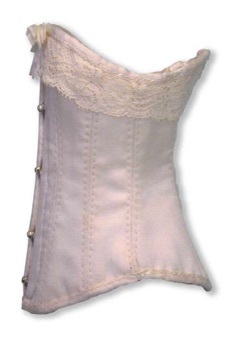 This style of corset was designed to make corsets considerably easier to put on and take off, laces did not have to be loosened as much as when the corset had to go over the wearer's head and shoulders. 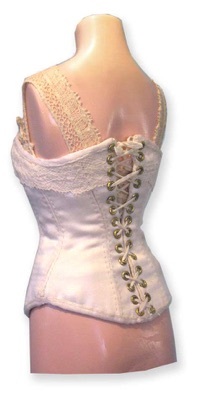 Our silk satin corset comes with pre stitched panels and lining, ready to insert busk and decorate with lace and ribbon. 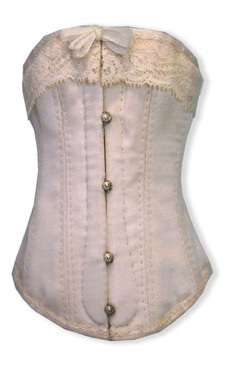 The back closure is laced with mock brass eyelet’s. 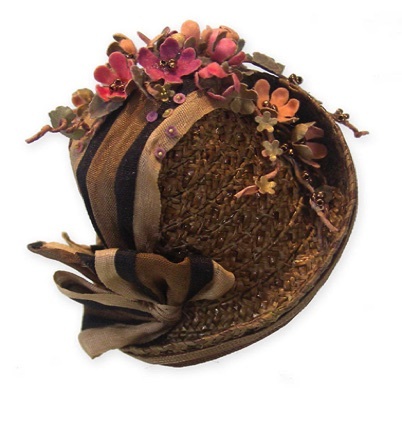 Each student will complete an enchanting mid Victorian hat decorated with rich autumn tone flowers and greenery. 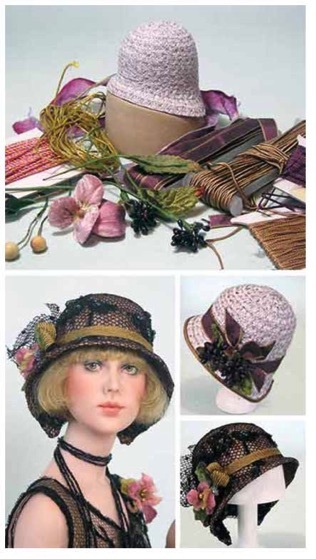 Made by hand stitching millenary braid the pot shaped hat is worked over a millenary block proved in class. 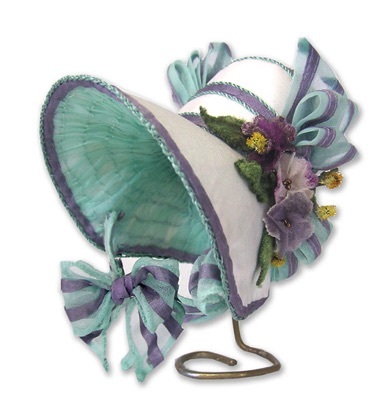 Assembling the flocked flowers and arranging the floral garland and silk ribbon will complete the elegant hat. 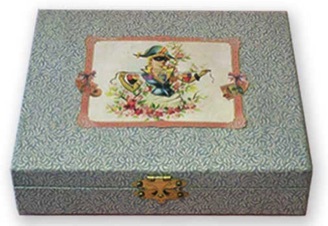 a small box will be provided for the hat journey home. 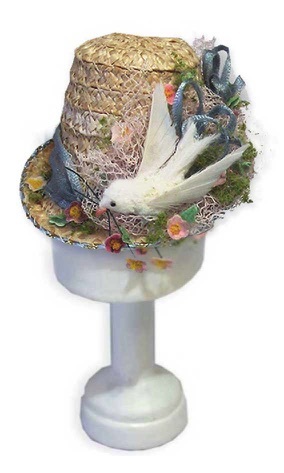 Each student will completing an enchanting mid Victorian hat decorated with a faux bird and flowers, Made by hand stitching millenary braid the flower pot shaped hat is worked over a millenary block proved in class. 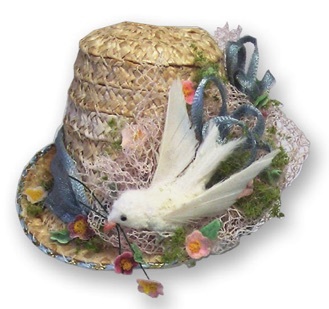 Assembling the flocked padded bird and flower and ribbon detail to complete the elegant hat. 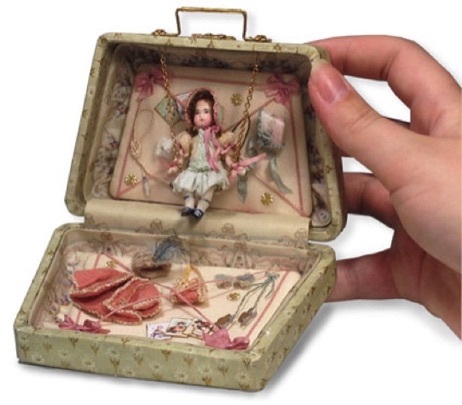 1/ 12th Scale Antique style silk lined presentation box and porcelain dressed doll with accessories. 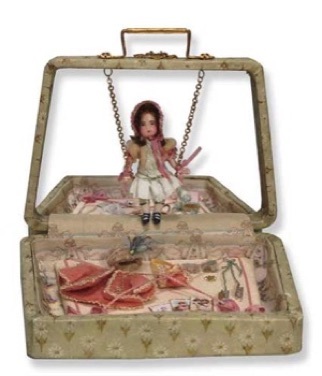 For a doll house child doll. 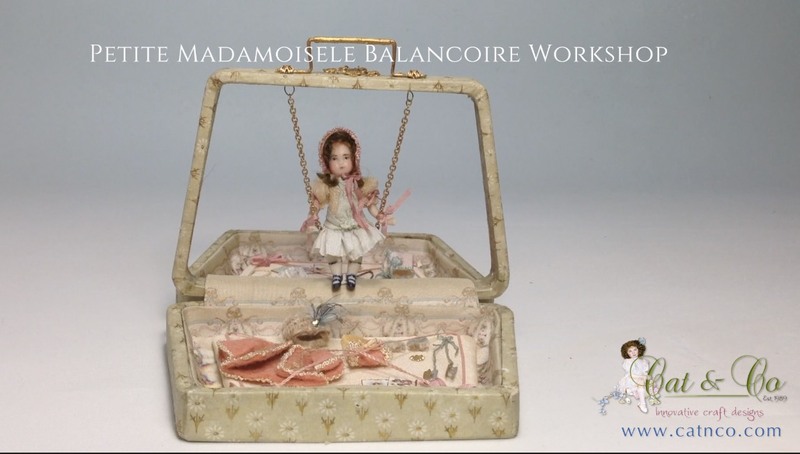 In this workshop you will make an antique style silk lined box for a little doll called “Dulcie”, putting the finishing touches to her silk tulle dress and making her wig. Pixie hat, muff and mittens. 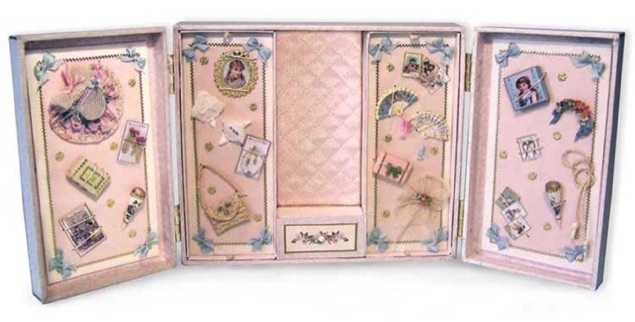 Perfume bottles, hair slides, hand mirror and Christmas postcards complete the box setting.  flowers and Christmas post cards. Tools needed small sharp scissors, clear craft glue and white glue. 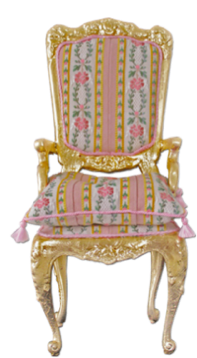 Catherine will share with the class her skills in millenary and velvet flower making. This elegant bonnet worked over a millenary block proved, will enabling students to create a fashionable 1815 circuit Parisian silk bonnet. The bonnet form will be pre blocked in white wool felt giving students a strong padded form to apply the silk taffeta covering and finish off with a lining of ruched silk organza. Bonnet covering and ruched linings are pre stitched, class will involve some hand stitching. 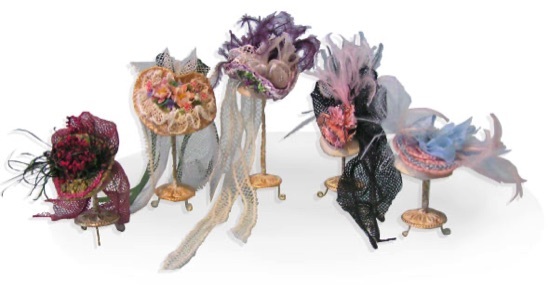 Students will decorate their bonnets with hand made velvet and silk flowers completed in class. Also demonstration of blocking felt forms. finished with a pretty blue bow. 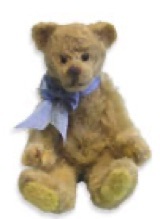 Teddys can be repositioned . 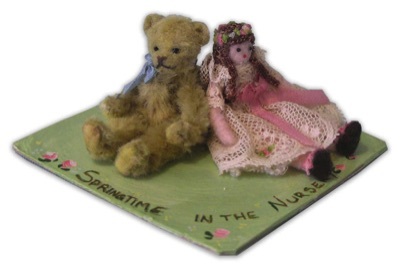 No sewing involved in this class Patterns and instructions will be provided, as well as additional supplies to create a second Teddy at home. Students: will need to bring small sharp tipped scissors. Vintage box to hold ephemera, love letter box and love letters, Victorian calendar, family tree chart, six silhouettes, eight calling cards, two book marks, three postcards, three vintage family photos, three folding photo wallets, six luggage tags, marriage certificate, three birthday cards, pressed flowers, envelops.  letters and specimen butterflies. 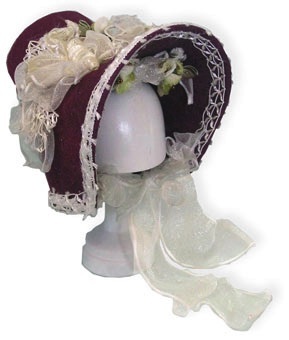 Catherine will share with the class her skills in millenary bonnet making This elegant bonnet worked over a millenary block proved, will enabling students to create a fashionable 1815 circuit Parisian Winter felt bonnet. The bonnet form will be pre blocked in plum wool felt giving students a strong form to apply the abundant ribbons and lace trim finish off with a organza ribbon to securely on dollies head. Class involve no hand stitching . 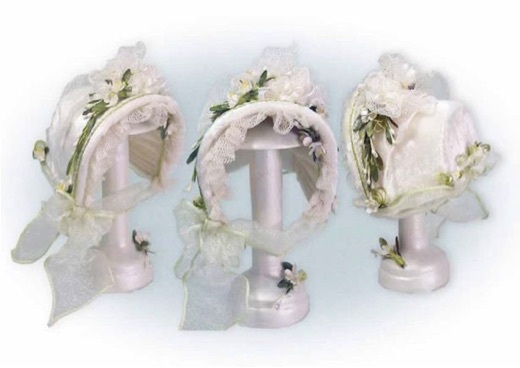 Students will decorate their bonnets with hand made velvet and silk flowers completed in class. 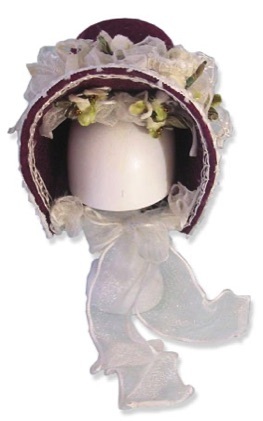 Bonnet suitable for a 16" to 17" fashion lady doll, a small box will be provided, for the hat’s journey home. The salon has been designed with lots of nooks and crannys to display the millinery work shop accessories and hats kits Both Merle and Catherine will be taking you through assembling and painting with added focus on paint techniques that will create a soft dimensional finish to the Salon. 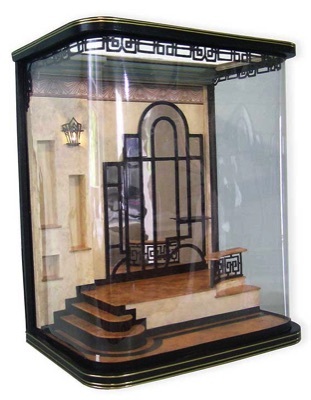 The framed room box has been pre cut from heavy weight card stock and shaped for easy assemblage, with a base coat of paint all ready to detail, allowing for completion of the room in 6 hours. The room is lit with natural light from a perspex skylight and highlights the fine filigree arch and glass fretwork winged mirror, both items to be completed and over washed in class. 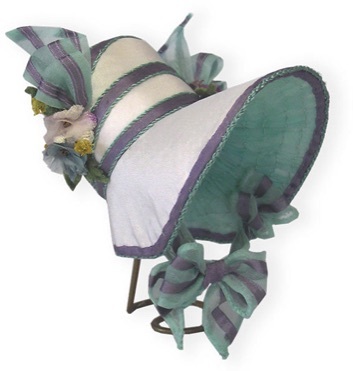 Chose any three hats from our collection of five Victorian hat designs. 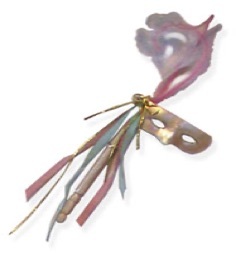 an enjoy creating your elegant braid, feathers and flowered chapeau. 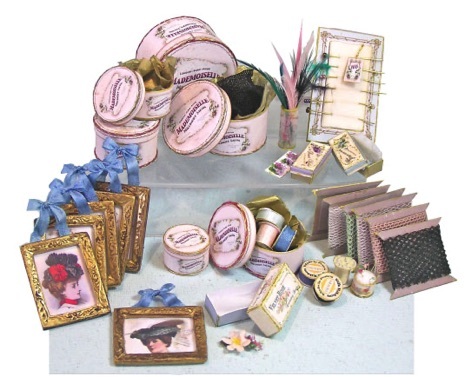 Students will cut and assemble 6 hat boxes in a variety of sizers, 2 small & 1 large flower box including pretty paper flowers to fill the boxes, small pin cushion, 6 framed hat images, 6 ribbon spools, 6 net display-cards, vase of hat feathers and a vintage style hat pin display board complete with variety of hat pins. 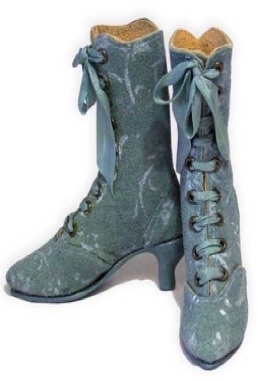 1875 Victorian Hat & Lace up Boots. 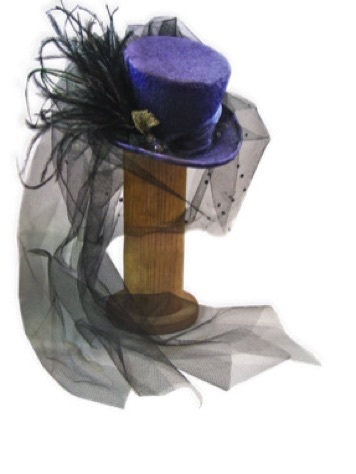 Catherine will share her skills in millenary and shoe making, each student will completing an enchanting mid Victorian hat decorated with a faux bird and flowers, along with a pair of ankle lace up boots. This small straw flower pot shaped hat will be worked over a millenary block proved. 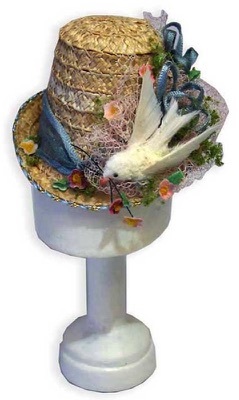 Class will involve a small amount of hand stitching of brim along with assemblage of bird and flower detail. Boots are cut and pre stitched ready for assembling, over a provide shoe last. 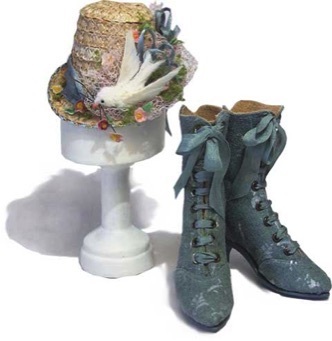 Hat & shoes are sized to fit 16'' or 17'' fashion doll and a small box will be provided for the hat and shoes journey home. 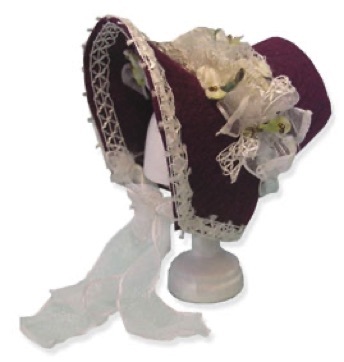 Catherine will share her skills in millenary and shoe making, each student will complete a charming mid Victorian child’s velvet and silk lined bonnet on worked over a blocked felt shape. The bonnet will be worked over a millenary block, that will be proved, the class will involve a small amount of hand stitching students will decorate their bonnets with hand made velvet and silk flowers completed in class. 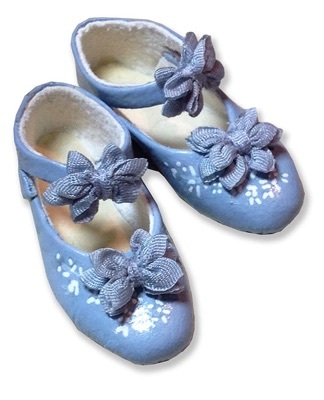 Along with the bonnet are a pair of leather faux embroidered toe shoes, that are cut and pre stitched ready for assembling, over a provided shoe last. 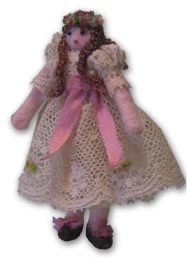 Hat & shoes are sized to fit 7'' or 8'' toddler doll and a small box will be provided for the hat and shoes journey home. 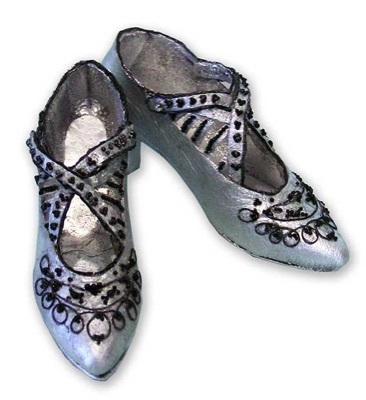 "One two button my shoe...."
small sharp scissors, pins and sewing needles & clear craft glue. 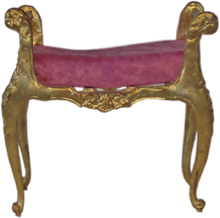 “Antique Riding”~ Rich purple felt Victorian ladies riding top hat, comes pre blocked ready to decorate with silk ribbon trims, spotted millinery veiling and ostrich feather. 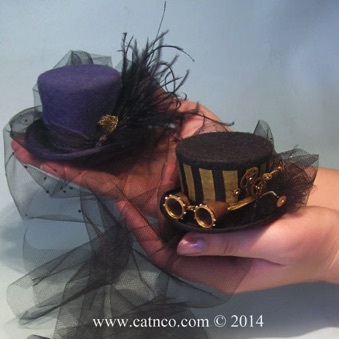 “Victorian Steam Punk”~ Metal cogs wheels and gears all part of the whimsy of this pre blocked black felt top hat. 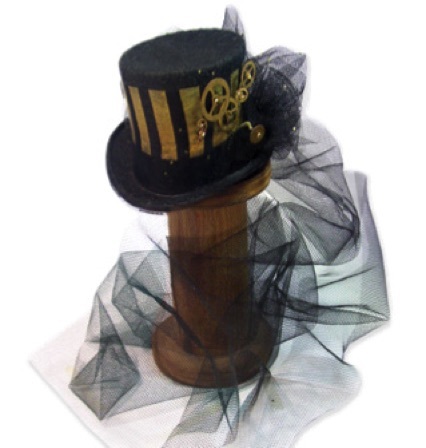 Students will learn technique of adding tremblers to create movement, decorating with silk ribbon and millinery net. 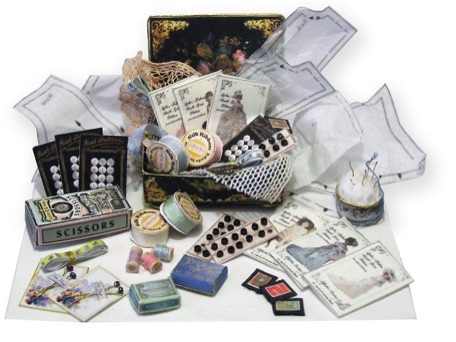 Students will need to bring Small sharp scissors, pins and sewing needles & clear craft glue. #1 Silk Velvet Devoré Cocoon Opera Jacket. the jacket with a bead braid and tassel closure at the hip. & shoes are sized to fit 16'' or 17'' fashion doll and a small box will be provided for the head dress and shoes for the journey home. Students will need to bring needle and pins. Catherine will share her skills in millenary and shoe making, each student will complete an Art Deco inspired evening head dress along with a pair of multi strapped evening shoes. This elegant feathered headdress is comes pre cut ready to assemble and decorate over a millenary block provided. Shoes are cut and pre stitched ready for assembling, over a provided shoe last. Students will need to bring pins. 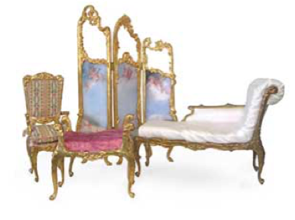 platform are covered in faux tan and black marble, ceiling has stepped cronies, wall paper friezes with fretwork on seat rail, ceiling mounts and detailed surrounding the looking glass mirror. Both Merle and Catherine will be taking you through assembling and painting with added focus on paint and papering techniques. 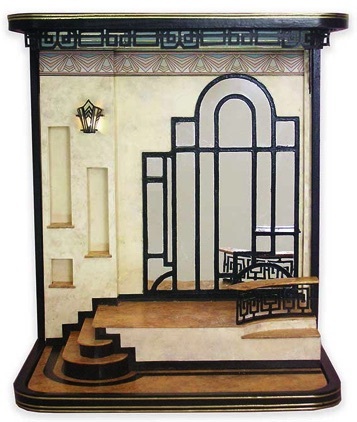 The display room has been pre cut from heavy weight card stock and shaped for easy assemblage, with a base coat of paint all ready to detail, allowing for completion of the room in this one day class. 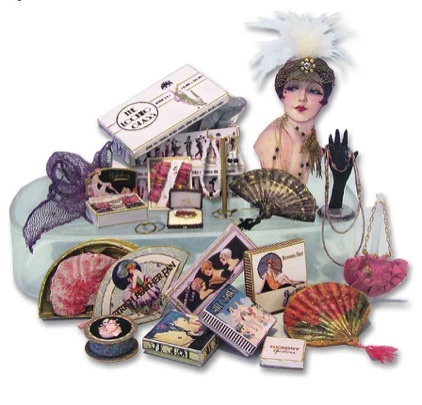 Students will assemble a variety of boxers, 2 large dress boxes, 2 shawl boxes,1 bathing suit box, 1 small garter clip box, a display card with two pink garters, store display box with 4 garters, 1 powder box, 1 fan box with paper feather fan, black and gold ladies fan, display store cardboard bust with feather head dress and neck lace, pink hydrangea fan, mauve silk net shawl, pink silk purse, counter display hand and necklace. 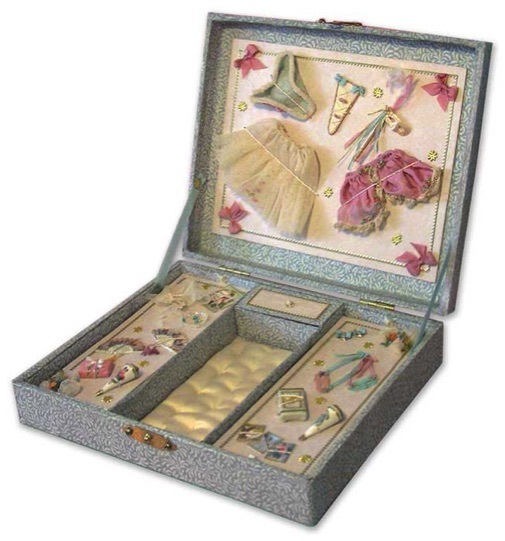 Also a collection of jewellery including a silk lined jewel box with jewelled broach, 2 bangles and a bead neck lace and earnings on brass display stand. Silk and lace 1920s flapper dress delicately detailed in fine gold and bronze beads, when completed will be displayed on a mannequin. 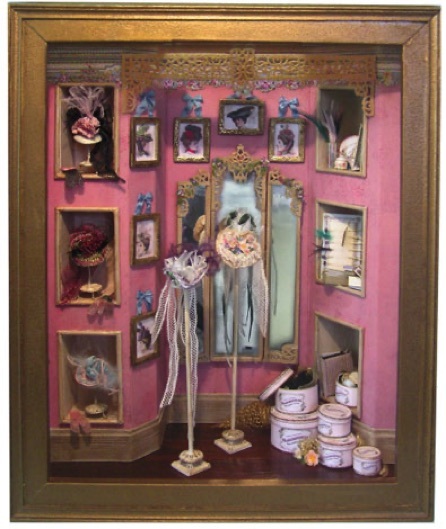 peacock fan, cloche hat on stand, and lace gloves with counter display hand. 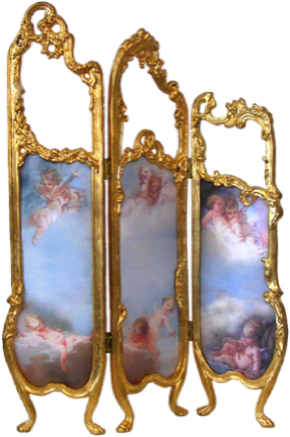 The tasseled and draped silk shawl, can be displayed with a sliver or gold purse. 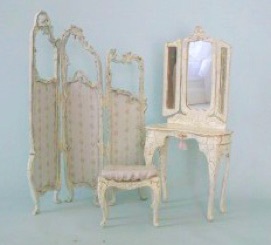 All items are scaled for 1/12th, this is a no sew class. 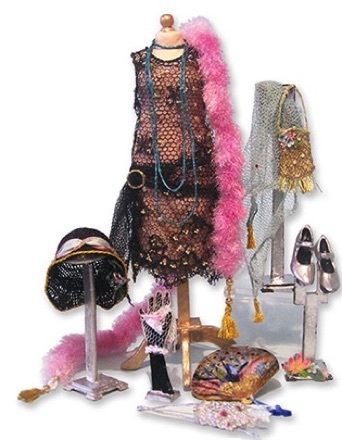 This selection of 1920’s ladies wear would be the bees knees to add to any display.